Book editors Jonathan Dewar, Glen Lowry, and Mike DeGagné will share their journey in the development of ‘Speaking My Truth’, highlight the importance of sharing the stories to advance awareness of the Indian Residential School system and engage participants in the notions of apology, denial, and reconciliation. Venue: First Nations House of Learning Great Hall. 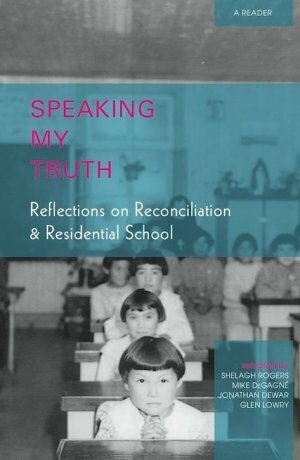 Speaking My Truth: Reflections on Reconciliation and Residential School is a collection of stories and essays drawn from the Aboriginal Healing Foundation’s three-volume series Truth and Reconciliation, which includes From Truth to Reconciliation; Response, Responsibility, and Renewal; and Cultivating Canada. Following the success of an earlier Book Club edition, this volume has been revised and re-edited for scholastic and academic purposes. These texts shed light on the lived and living experiences and legacies of Residential Schools and are published in the hope that they will become as part of an important dialogue on reconciliation in Canada. For additional information, to access electronic versions, to order additional free copies, or to share feedback, please visit speakingmytruth.ca. Dr. Mike DeGagné is the seventh President and Vice-Chancellor of Nipissing University in North Bay. He is a former member of the Algoma University Board of Governors, and was the founding Executive Director of the Aboriginal Healing Foundation from 1998–2012. He also served as an Executive with Indian and Northern Affairs Canada from 1988–98. Jonathan Dewar is both the Director of the Shingwauk Residential Schools Centre, and is the Special Advisor to the President of the Residential Schools Legacy. He served as the Director of Research at the Aboriginal Healing Foundation from 2007–12, and is also a past Director of the Métis Centre at the National Aboriginal Health Organization. Dr. Glen Lowry, who was the Shingwauk Residential Schools Centre Visiting Scholar from Dec 2012 to June 2013, is an Associate Professor at Emily Carr University of Art + Design. His area of interest is contemporary Canadian culture, including literature, photography, television, and film. And he is particularly focused on questions of social justice, reconciliation and creative collaboration. 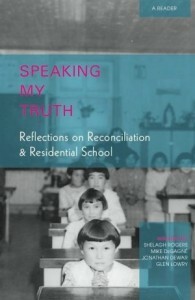 “Speaking My Truth will help advance the knowledge of Canada’s unfortunate experience with residential schools. I’m confident the book will provide high school and university educators with a significant resource for generating understanding and much-needed debate around this topic,” said Algoma University’s President, Dr. Myers.